Artabotrys hexapetalus- Annonaceae. This species has previously been classified as A. uncinatus and A. odoratissimus. Tropical Asia. This species is really a shrub in our experience. Maybe some plants have a more vine-like habit if grown in a forest setting. Glossy green leaves. Tolerates full sun to medium shade. 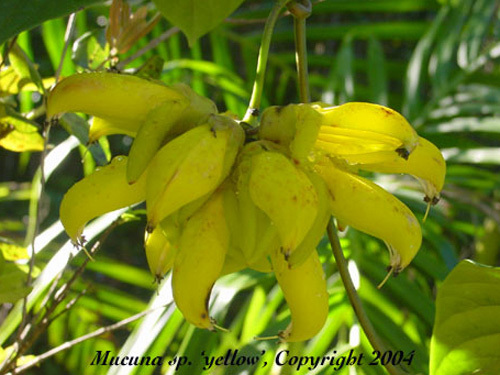 Grows best if temperatures are above 45 degrees F. although it will tolerate temps near freezing. .
Beaumontia grandiflora- Apocynaceae. Common name: Easter lily vine. Large vine native to the Himalayas. Large white flowers similar in shape to the Easter lily. Glossy leaves up to 8 inches long. Our plants are developing stout stems and it may be possible to prune this to a shrub. Outdoors in USDA Zone 10 or in a large pot indoors. Easy from seed.I'm barely covering them and maintaining at 85F. Germination begins in 5 days and is complete by 2 weeks. Probably can be propagated by cuttings too. I have a large vine that hasnt' bloomed. I've heard that this species needs a cool period in the winter. May be better at higher elevations in Hawaii. Hoya "Ruthie"- Large star shaped waxy flowers about 1.5 to 1.75 inches in diameter. Tips are red and the center is a pale green color. Flowers are long lasting and plants bloom several times per year. Growth rates are moderate to fast. Thick deep green leaves. Blooms well in a container. Full sun to medium shade. Slightly acidic well drained soil. Use a terrestrial orchid mix. Keep warm. Hoyas do not like cool temperatures. Outdoors in Zone 11. Good indoor plant for a bright location. Lablab purpureus- Fabaceae. Syn. Dolichos lablab. Common names: hyacinth bean, lablab. Perrenial vine up to 30 ft. Purple flowers and dark purple seed pods. Leaves have purple tint. Fast growing in hot weather. Sometimes planted as a cover crop. Young tender pods may be eaten. Mucuna bennettii- Fabaceae. 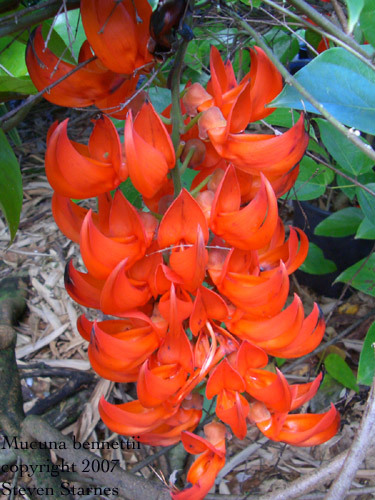 Common name: Red jade vine. Tropical climber with racemes of bright red flowers. Each flower is about 2.5 inches long. The entire raceme is usually over a foot long. Stunning when in bloom. Growth is rapid in hot weather. Excellent for covering a fence, trellis, or arbor in frost free areas. In temperate regions, it can be grown in a large container. Prune back in the fall and bring indoors. Develops a woody trunk with age. Yes I typed typed tt. Mucuna pruriens- Fabaceae. Common name: Velvet Bean. I have a white flowered selection which seems to have no itchy hairs on the vine and pod. Vigourous and fast growing. It can reach 50 ft. in a few months. The roasted seeds are reported to be used to make coffee-like beverage in South America. Seeds are toxic raw. Pandorea jasminoides-Bower of Beauty vine. Native to Australia. Glossy dark green pinnate leaves and masses of pink trumpet flowers. Germination occurs over 2-4 weeks. Barely cover seeds. Blooms when small. My seedlings began to bloom when 4 months old and only 10 inches tall. Zone 9 or 10. 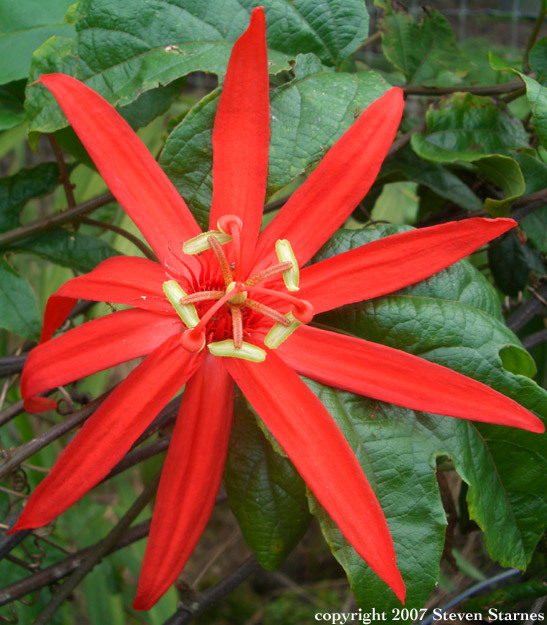 Passiflora vitifolia- Common Name: Red Passion Flower. As the botanical name suggest the leaves are similar in shape to grape leaves. Vigorous vine in Hawaii. Produces large bright red flowers about 6 inches in diameter. Slightly acid soil. Full Sun. Hardy to 32 degrees F.
Podranea ricasoliana- Bignoniaceae. Common name: Pink trumpet vine. Bignoniaceae. A sturdy and attractive vine with finely divided leaves and pink flowers. Hardy in Coastal California. When we were in California, my vine survived 5 winters outside. Defoliates at about 26 degrees F. Regrows quickly after frost damage. Zone 10 or possibly zone 9. Podranea brycei- Bignoniaceae. Similar to the above species. Clusters of 5 to 7 pale pink flowers about 1.5 to 2 inches across. Our seeds have just germinated. It will be next year before we can propagate this species in large quantities. Strongylodon macrobotrys- Family: Fabaceae. Common Name: Blue Jade Vine. Vigorous vine with teal/turquoise flowers. Inflorescense can be up to 4 ft. long. Requires a large trellis or a fence to vine. Deep green leaves. Blooms periodically throughout the year. Propagation is by cuttings. I typically have 50% to 70% of the cuttings root and grow. Full sun. Almost any soil. Warm tropical temperatures are best. I've had reports that it will grow outdoors in Southern California. Thunbergia fragrans- Acanthaceae. Woody twiner native to India and Sri Lanka. Flowers are white 2 inches wide. The flowers do not seem to be fragrant in spite of the name. I've tried smelling them through out the day and early evening and can detect no fragrance. Fast growing in full sun. Germination begins in about 7 days at 85F. Seems to be seeding and spreading in my yard so it may be moderately invasive in Hawaii. steve_starnes@yahoo.com Responses may take 2 days. Do not send attachments; plain text only. We receive several emamils each week that cause errors when we reply. If you do not get a response after 3 days, please email again or phone.